A few days back I wrote about an AreoGarden that we received as a gift. It is designed to sprout and grow these little cups of preplanted seeds hydroponically. As I said then, I want to use just the grow lights for my own seed plantings. However, the herb seeds were set up when we brought it home, and here is an update. The seeds are supposed to sprout in 3 to 14 days depending on the type of herb. The parsley – nothing. The cilantro – I can see the swollen seeds, but no growth showing. The chives – a teeny, tiny bit of green showing. The Italian basil has sprouted several plants which look good and healthy. The purple basil is looking good, too. The dill has sprouted one seed showing a thin, tiny plant. And, finally, the mint has produced several seedlings. As you can see from these few, paltry seedlings there won’t be a Jan’s Herb Farm starting anytime soon. Well, at least I know that seeds will sprout with the AeroGarden, and it does give me something green to look at and play with until I can get outside and work in my real garden. 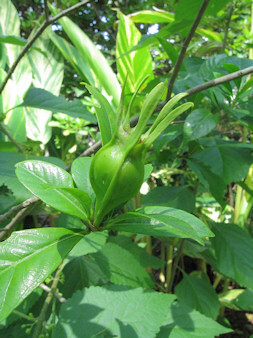 Back in November I wrote about the gardenia seed pod that was starting to ripen. In that post, I showed the green pod as I first saw it in July and how it was ripening to a orange-gold. 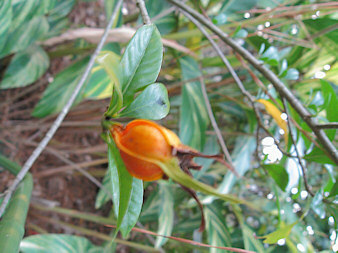 Well, the seed pod has finally fallen off the gardenia bush after turning a bright red. I couldn’t wait any longer and decided to open the pod up and to see what was inside. The pod was still fleshy inside after I opened it up. I was surprised to find many little seeds. I figured that there would have been one big seed, but that idea turned out to be wrong. After the pod dries up a little more, I will wash the seeds, and then plant them. I still have been unable to find out any information on germinating gardenia seeds, so I may try a few different methods. I don’t know if they need light to germinate or not, so I’ll try both ways. It will be interesting to see if any sprout. Wish me luck. Even though some tropicals are still blooming and some tender perennials are still unaffected by the cold temperatures, there is no denying that the growing season is behind us. 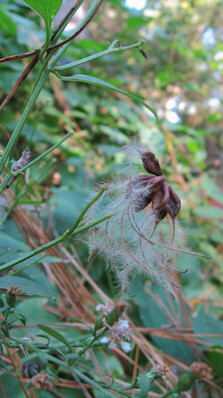 The autumn clematis seed head is a confirmation of that. Blooming in late summer/early autumn, this vine is one of the last plants to start flowering, so when it goes to seed that makes it definite that winter is on its way. With living just north of the Gulf Coast, we still will have many mild days ahead as well as an occasional freezing one. 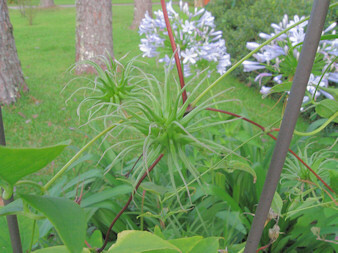 This seed head is just a sign that it is time to pull out the garden books, magazines, and catalogues and start planning for next year’s garden. Today, while walking around the garden just checking things out, I noticed a bright orange “something” on the gardenia bush. On looking closer, I discovered it was the seed pod I first saw back in the summer. Being green and inconspicuous, I guess I forgot all about it until the bright color of the ripening pod caught my attention. Here it is nice and green in July. The next photo shows it now. It must be just about ripe. I am going to have to watch it closely now to make sure that it doesn’t pop open and spill the seeds. I don’t know what I will do with the seeds. 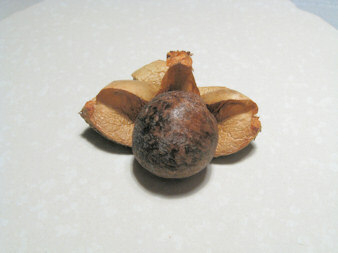 I will plant them, but I can find no information on germinating gardenia seeds. I have had gardenia bushes here for over thirty years and have never seen a seed pod before, so maybe it is rare for them to form seeds. You would think with all the information out there on the world wide web, I could find something, but so far no luck. Nothing in my garden books, either. Well, I am not going to count on anything until I actually have the seeds in hand. However, I think that if I could get some plants from the seeds that would be something worth writing about. 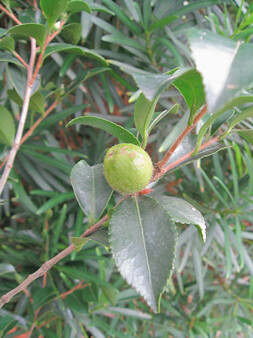 A few weeks ago, I wrote about finding a seed on the sasanqua camellia I bought last year. I had been watching the little seed until the shrub started blooming. When it started blooming several days ago, I turned the container it was in so that more flowers could be seen, and in doing so, I turned the seed pod to the back and forgot about it. That is until yesterday. Here is the seed pod on September 12th. Yesterday, when I went out to check how the seed pod was coming along, I fully expected to see it on the shrub, just a little larger than before. But, instead, I found the casing brown and burst open. I couldn’t believe it. I had lost my one seed. I quickly looked around, and found it on the ground next to the container. It must have opened only recently because it was sitting on top of the grass. I quickly picked it up and checked to see that it fit in the seed casing. It was a perfect fit, so I know I have the right sasanqua seed and not some other stray seed that just happened to be hanging around. The seed ended up being about the size of my thumbnail. I planted it in a container and will see if it comes up. I am glad I was able to save that little seed because if it had started to grow where I found it, I am sure I would have just pulled it up not realizing it was a little sasanqua. I know if it germanates that it will be years before I see any flowers bloom, but I think it will be nice, if not a challenge, to see if I can grow a sasanqua from seed. Today was one of those rare days. A lazy summer day. Too hot to do anything, and the time in which to do nothing. I stayed inside, read the newspaper, watched movies on TV, and did a little cooking. It was a very relaxing day. This morning I did venture out to see what was going on in the garden and take a few photos of anything interesting. One thing that did intrigue me was a gardenia seedpod. I have had gardenia bushes here for about thirty years and have never seen a seed pod before. This is not a particularly old shrub – maybe four years. It is one my mother rooted from some flowers I had given her from some of my older bushes. I didn’t know that gardenias made seed pods, but I guess they do. 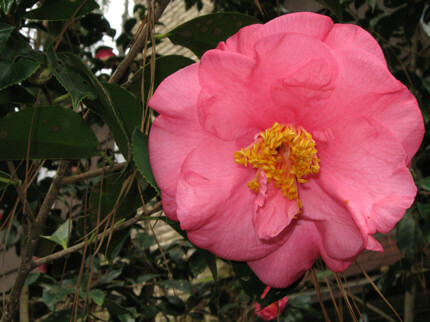 I am not too surprised by this because last year an old camellia produced one also. When I researched this, I found out that occasionally camillias do make seedpods, so, maybe, it is the same with gardenias. Another plant I thought I’d show is a new sweet potato vine I got a few weeks ago. 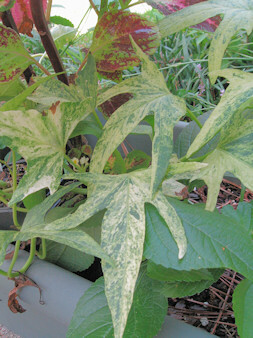 It is Sweet Caroline, a variegated one that looks good with my favorite coleus. Here is a closeup of Sweet Caroline that shows her colors a little better. I will definitely try and overwinter this new sweet potato vine. Well, after such a relaxing day, I’m sure I will be ready for a more active day tomorrow. We usually think of plants making seedheads in autumn when the growing season is winding down, and plants are preparing to ensure that their species survives. Well, here it is the first full week of July, and already seedheads are appearing. The clemitis crispa has made several seedheads. It would be nice if they dry on the vine and can be collected to plant for next year. It is a very interesting form with all the twisty little projections. I was very surprised by the seedhead considering that the flower is a single bell shape. 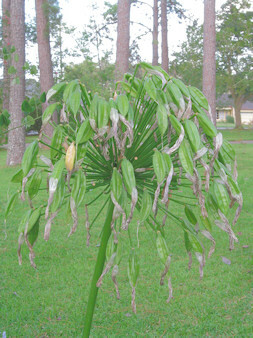 The first of the agapanthus to bloom has already set seeds. I cut the seed heads off, dry, and save for flower arrangements. Since I will not be using the seeds and I want the plant’s energy to go into renewing the agapanthus, I do not allow the seeds to ripen. However, I do leave them on the plant for a while because I like the architectural element they add to the garden. There will be more seeds forming in the coming months. These are just the first and a reminder of the cycle of nature. Today I started my seeds. I prepare my own seed starting mix. I use 10% perlite, 10% vermiculite, and 80% peat moss. This has worked successfully for me for years. I start by mixing up the above, damping it, and then placing it in the six packs or whatever I am using. I add the seeds, and if they need only a slight covering of soil, I just sprinkle a little of the dry mixture on top and then using a mister dampen the dry soil. I make sure to label each container. In the past, if I was planting the same thing in more than one flat, I would label just one and keep them all together. But, I guess my memory just isn’t as good as it used to be, or maybe I am planting more because now I just can’t keep every thing straight in my mind. For example, last year when I rooted three different types of hydrangas, I didn’t label each and every one, and now there are a few that I don’t know which are which. So I now am more careful. I usually write the name of the plant with marker on the container. That way I don’t have to worry about losing a name because the wooden one discolored or rotted, etc. I planted the following seeds: coleus, moonflower, morning glory, cypress vine, hosta, toad lily, lettuce and, for the first time, gerber daisies. I have a few more I want to start, but that will have to wait for another day. Everyone is receiving seed catalogs now, and I am no exception. 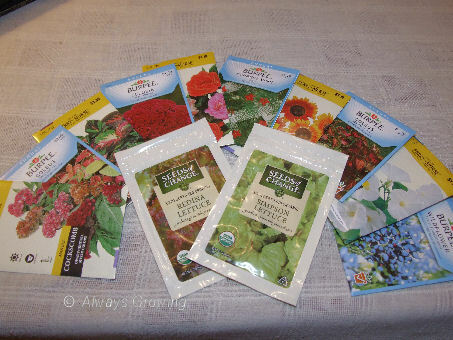 For the last 10 or so years I have been starting seeds for spring planting. 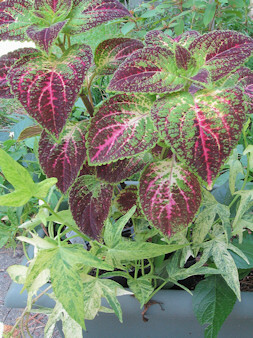 I usually do about five different varieties of coleus for mass plantings in containers or the garden to fill in bare areas. I have been buying the seeds from Parks. I usually do the Giant Exhibition (limelight, palisandra, and copper queen) and Wizard Mix. I think this year I might try cleome again. I tried it a few years back but didn’t have enough sun to grow it. Now that Hurricane Katrina took down some of the big pine trees we had, there is more sun to grow them. I also am going to start some ornamental peppers. After looking at the Stokes Seed catalog, I may order some of these from them as well as Parks. I have collected some seeds myself and will try them. I have some toad lily seeds, and I have had great success in the past in growing them. I also saved some ornamental millet seeds, moonflower, red ruella, and gerber daisy seeds and will plant them also. The one thing I am resolved to do this year is to start the seeds early. Every year so far, I start them just a little too late. This isn’t a real problem, but it does delay putting them in the garden, and then it takes them a while to get going. In the past, I really did not have a place to put the seeds where they would get sufficient light, and I think that is why I delayed starting them. Now, however, I have an area that gets enough sun and can be protected from the cold. I make my own seed starting mix. I use 10% vermiculite, 10% perlite, and 80% ground peat moss. I have used this for several years and have had great success starting seeds with it.